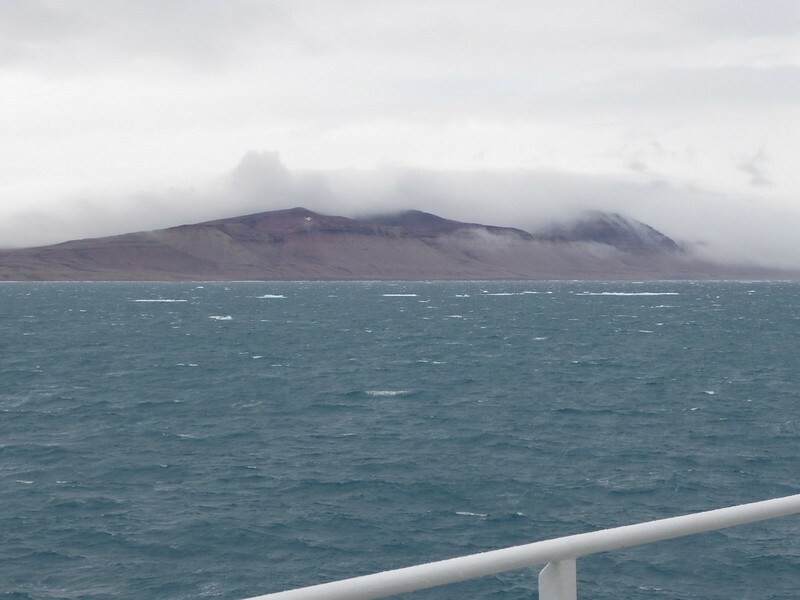 It was a calm but foggy morning as we awakened and we were approaching Bylot Island which is part of Sirmilik National Park and a bird sanctuary. 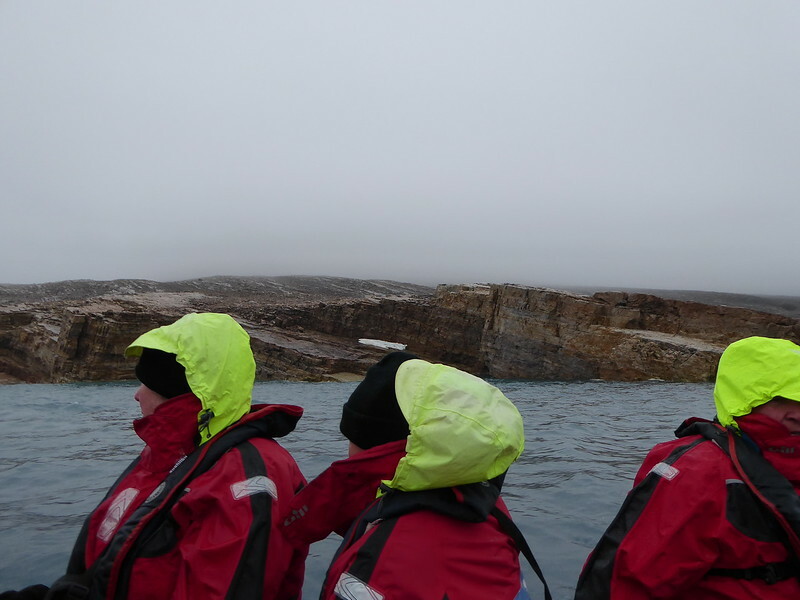 (#7) In the morning, we had presentations, one on how Arctic mammals adapt to the cold and one on icebergs. 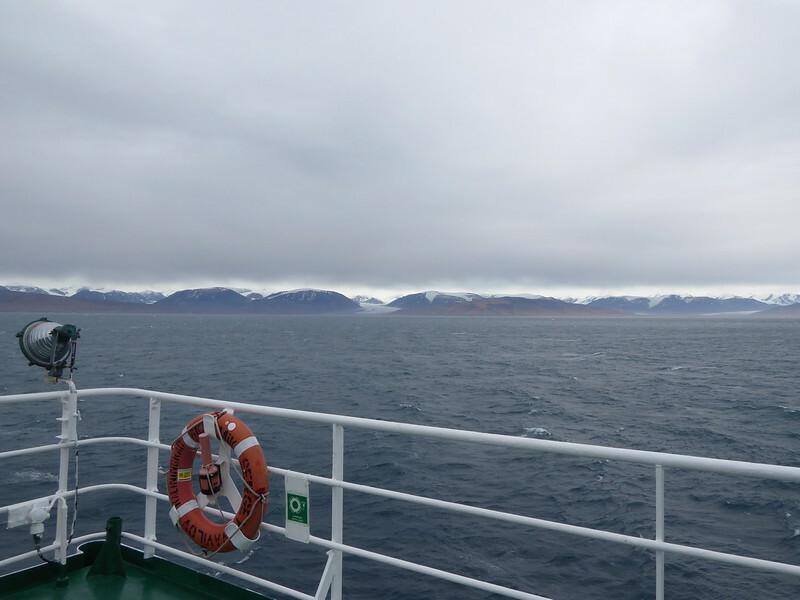 There are enough Zodiacs on board to take all the participants in the expedition including the staff members that provide information to us and interact with us. We were 9-10 per Zodiac. 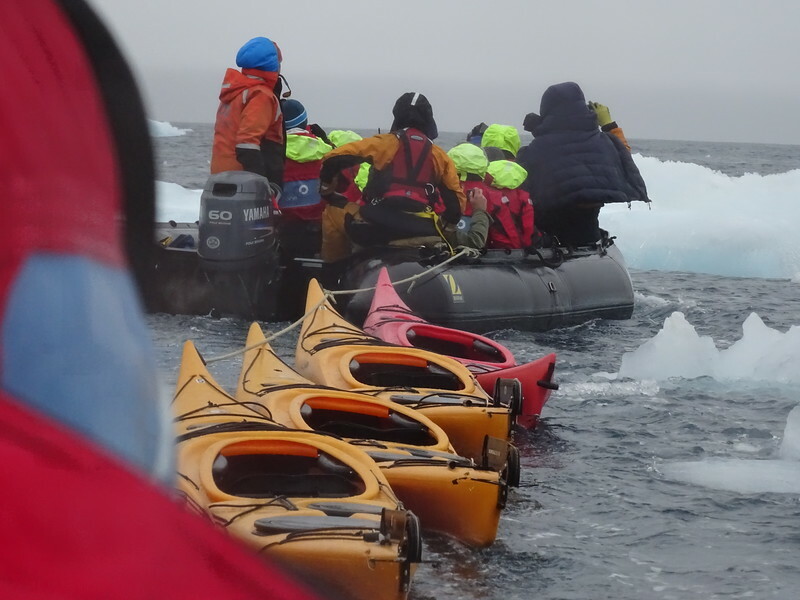 One Zodiac was also towing a flotilla of kayaks which the intrepid occupants of the Zodiac intended to board and then paddle. 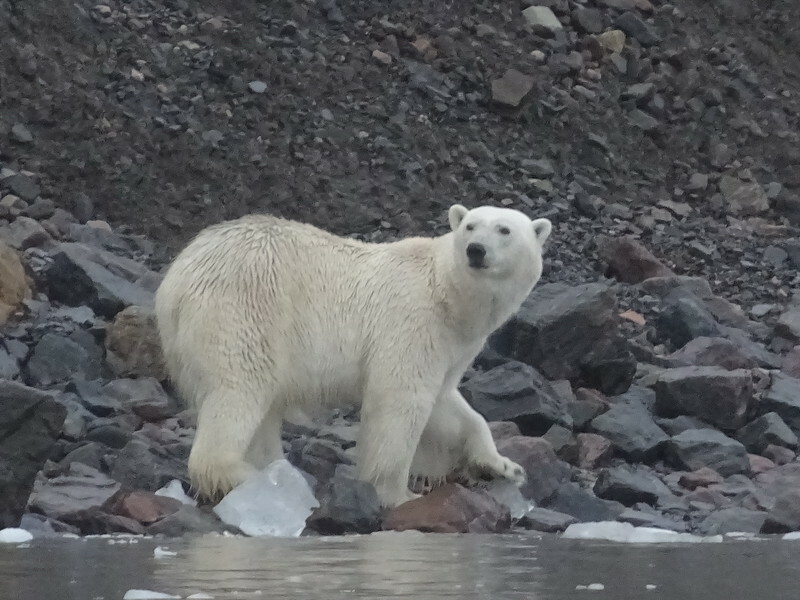 However, one of the first Zodiacs came upon three polar bears in the bay. 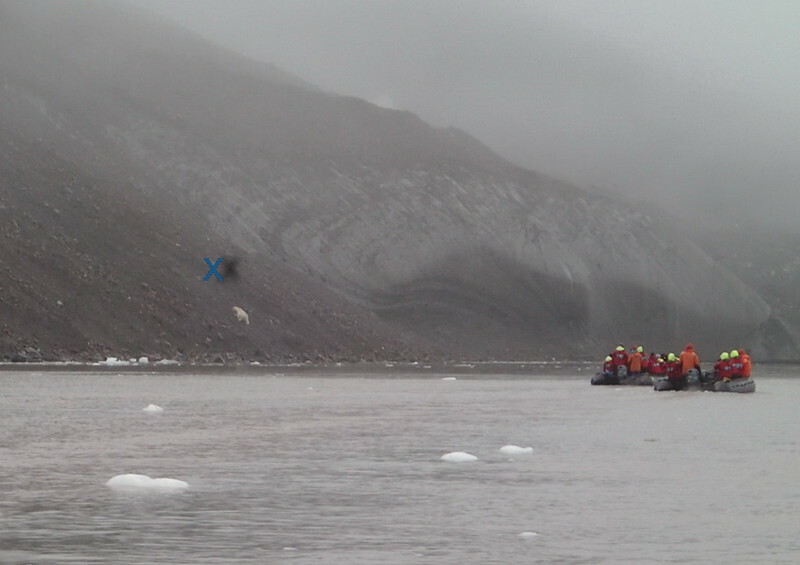 Two of those bears immediately swam away, but the third one climbed onto the glacier and we watched him walk along it for some time. We were told it was a male about 4-5 years old. But his presence eliminated the possibility of kayaking in the bay. 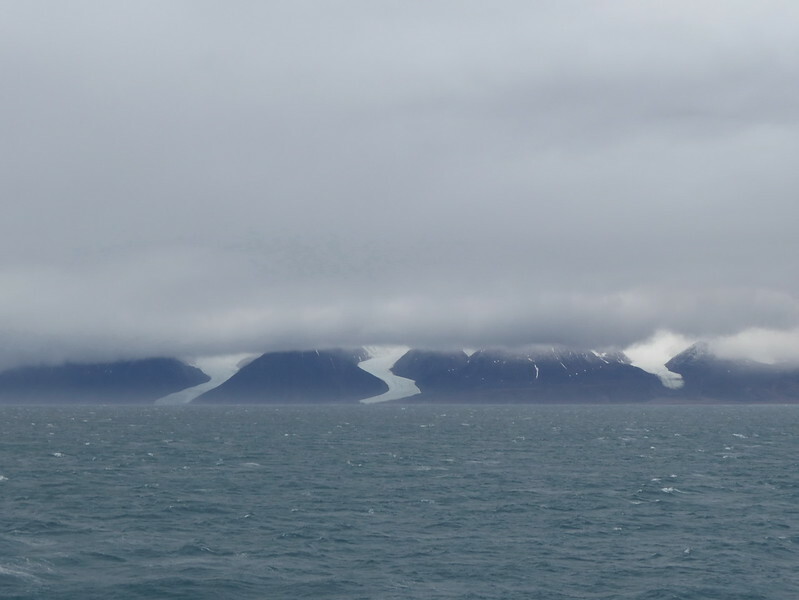 This bay occurs where at least one glacier reaches the water. 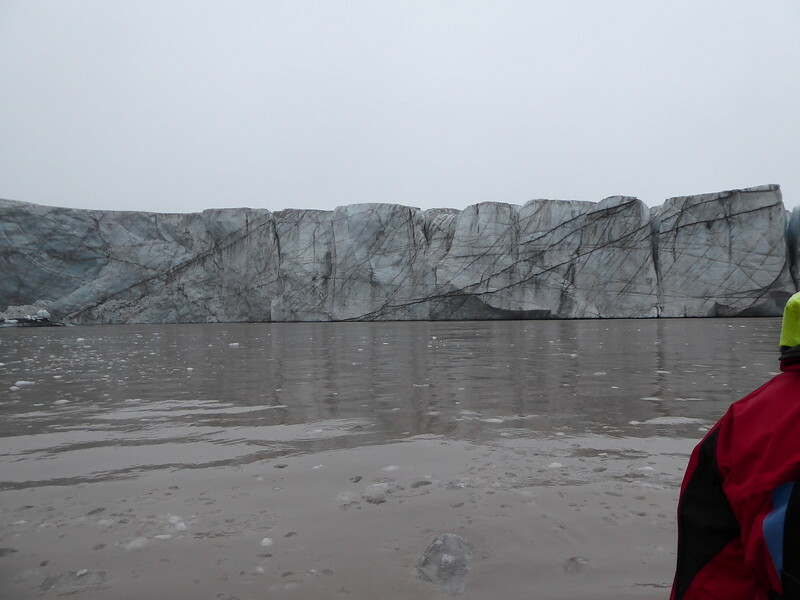 At the far end of the bay, the wall of dirty ice looks just like marble cliffs. 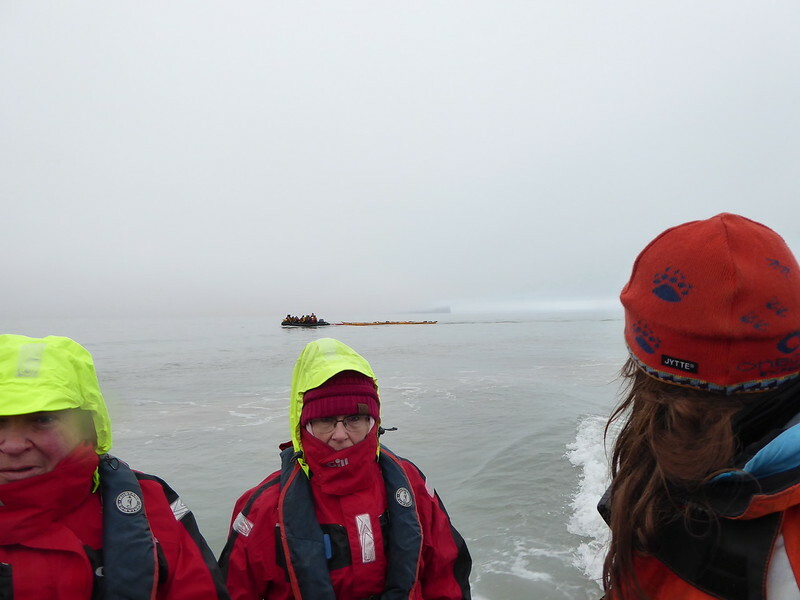 We also took a look at a fairly large chunk of sea ice in the bay. And at one side, a muddy river was pouring into the bay which made the water muddy. It also began raining. 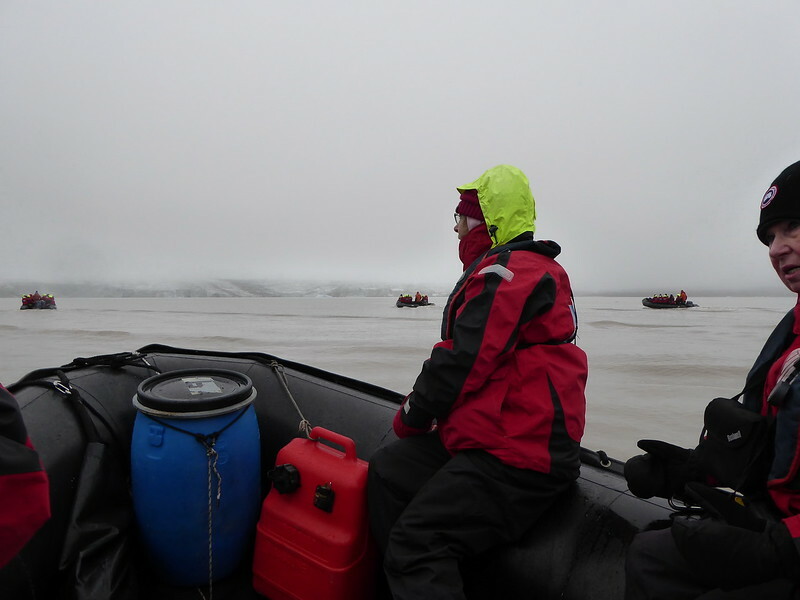 After a couple of hours in the bay, we headed back to the ship, which looked like a ghost ship in the mist and rain and we found the winds had shifted, bringing in large floes of sea ice and it was a challenge to find a path through them with the Zodiacs, but we made it and were greeted upon our arrival back on board with a cup of hot chocolate and Baileys. 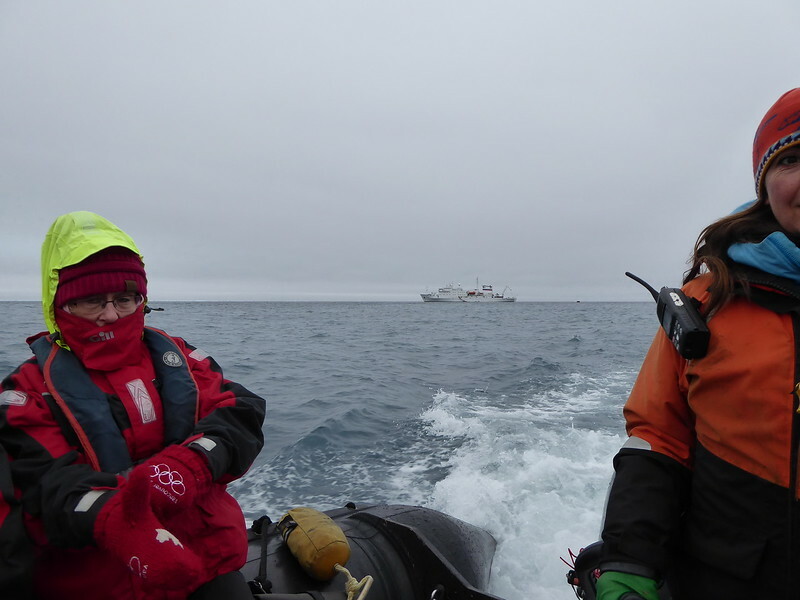 Kudos to Captain Becky for her manoeuvring of our Zodiac. 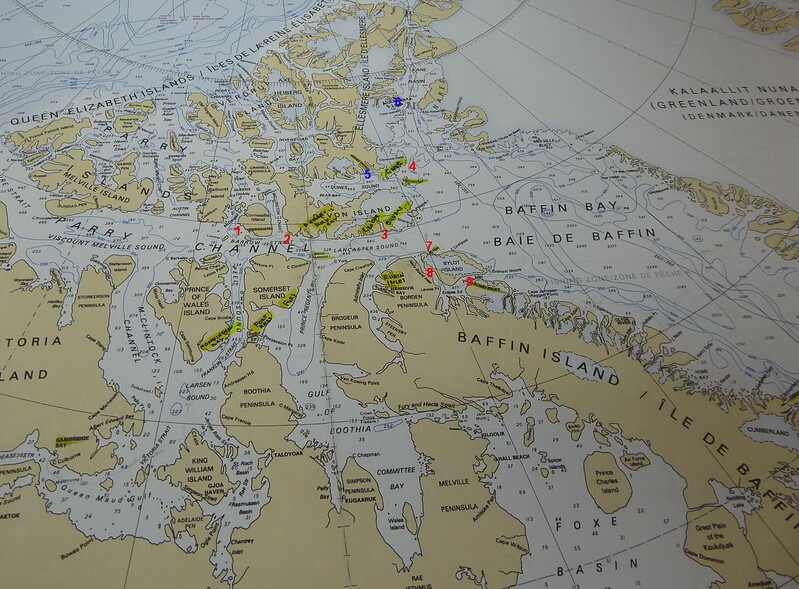 Ocean Notes for August 27. 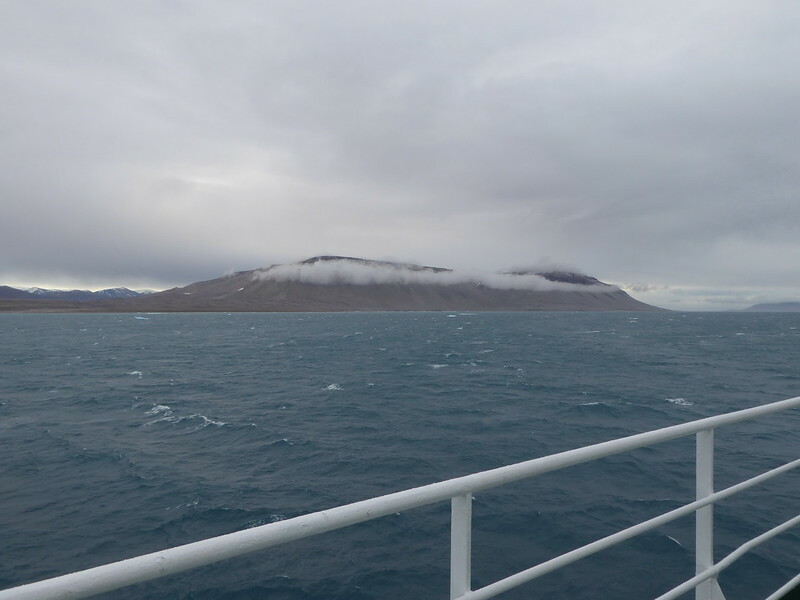 Approaching Cape Hay on Bylot Island. This is a National Bird Sanctuary. 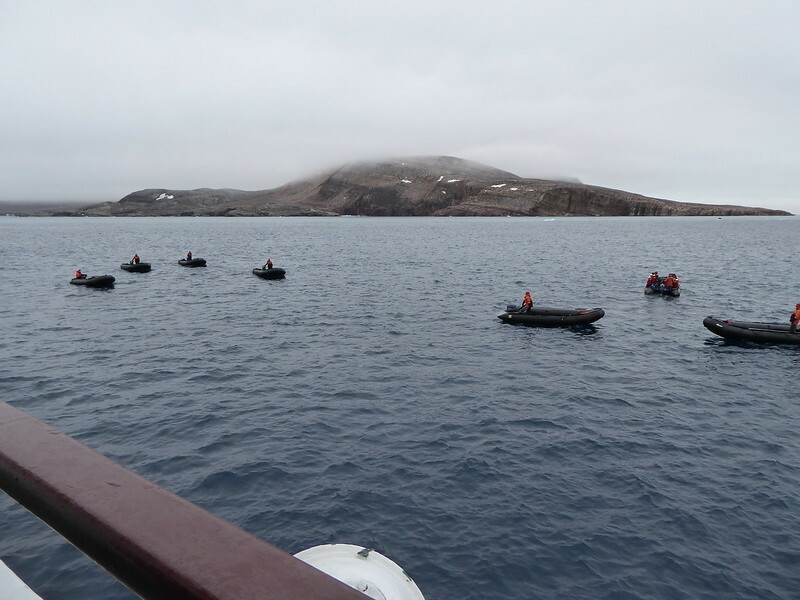 A flotilla of Zodiacs awaiting passengers. 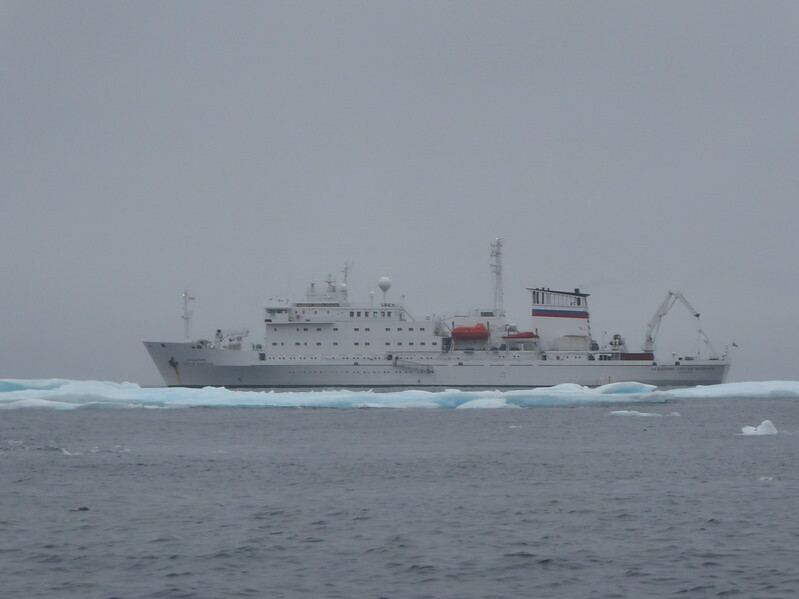 The Vavilov carries enough Zodiacs to take all passengers out at once. 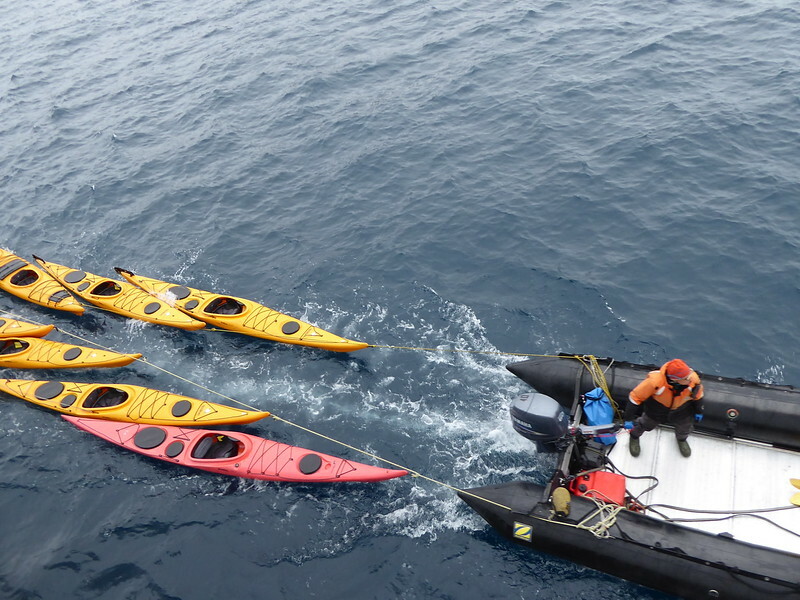 One Zodiac is towing kayaks for those intrepid sea kayakers on the voyage. Lining up to get on the Zodiacs. Footwear in the Zodiaks. 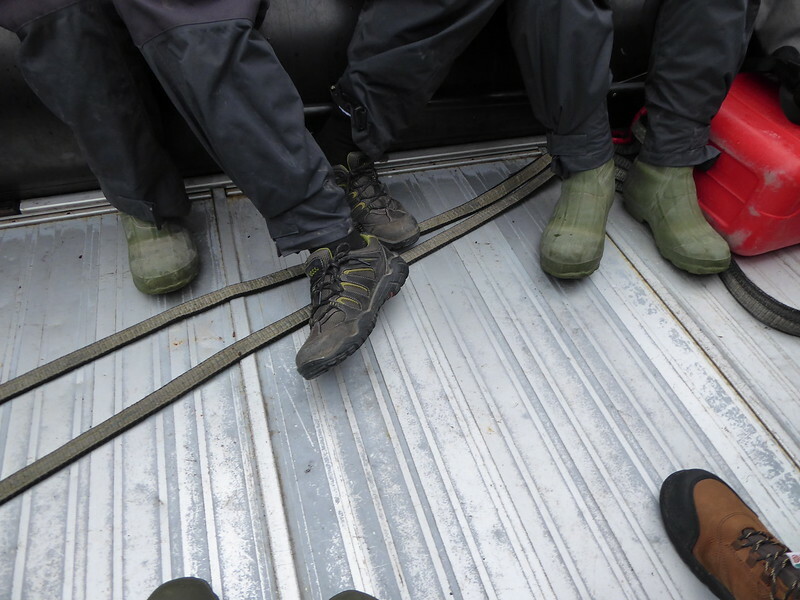 Mostly ship issued gum boots, but a few other boots as well as we didn't have to wade to shore this time. 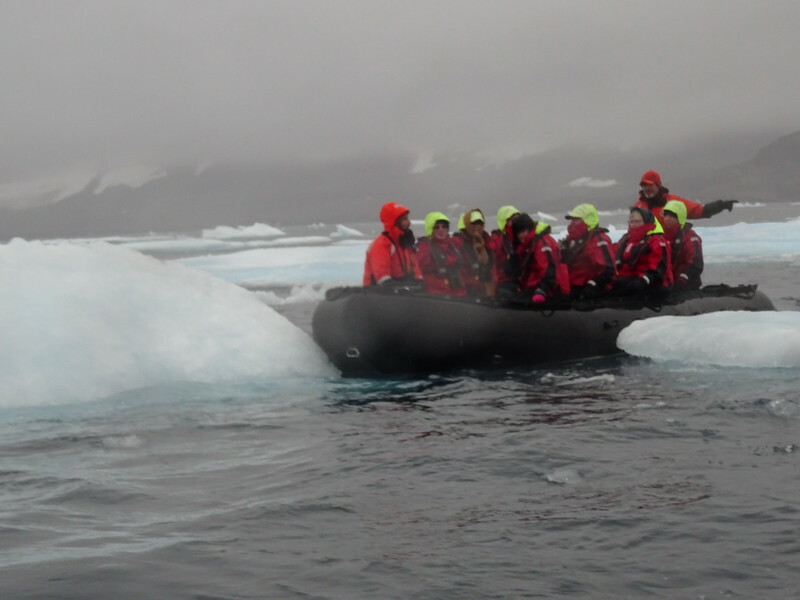 Looking back at the ship from our Zodiac. 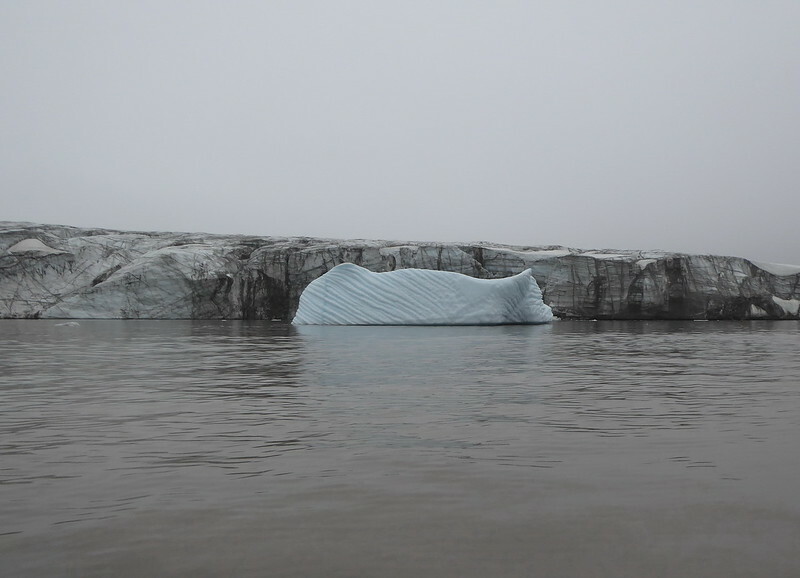 A smallish iceberg of dirty ice from the glaciers here. 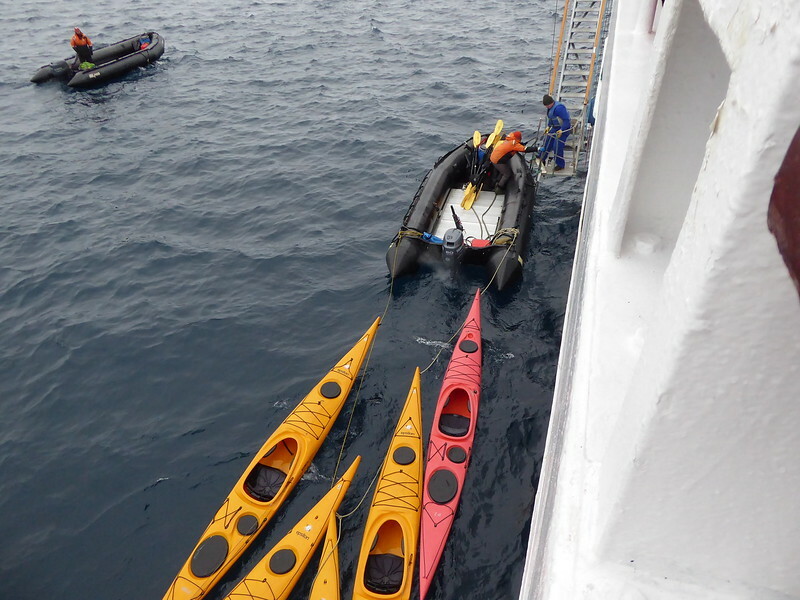 A view of the Zodiac with the kayaks. 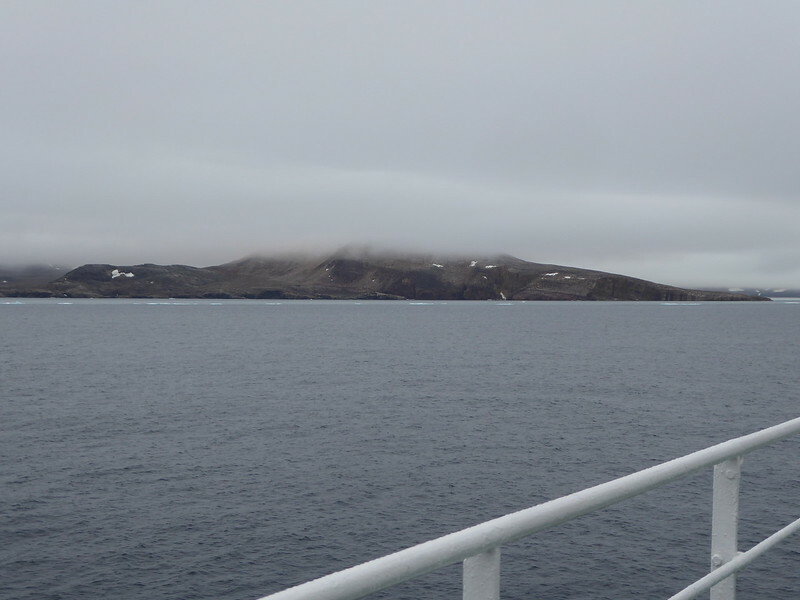 Approaching the Cape which has steep dolomite walls on part of it and sheared off glacier, which looks like white marble on much of it. 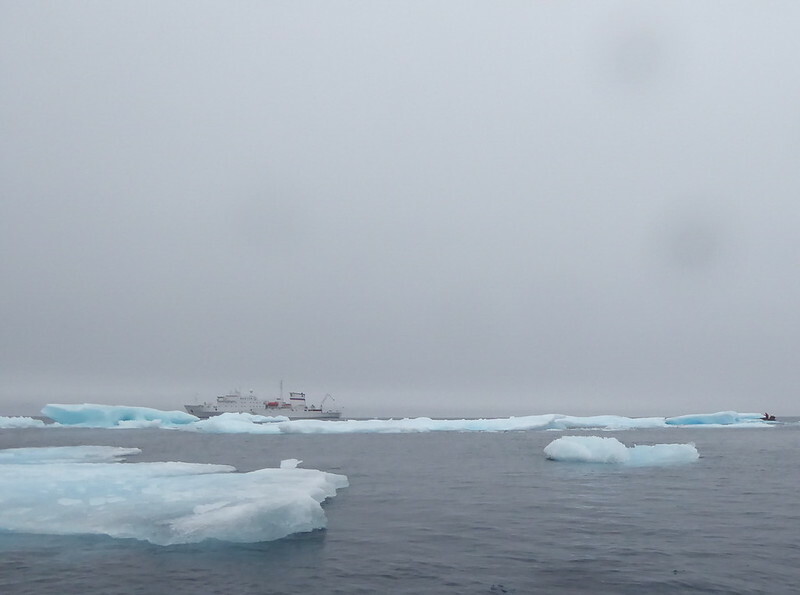 Some of the first boats out encountered three polar bears. This is not my picture, but you'll see one climbing just below the blue x. 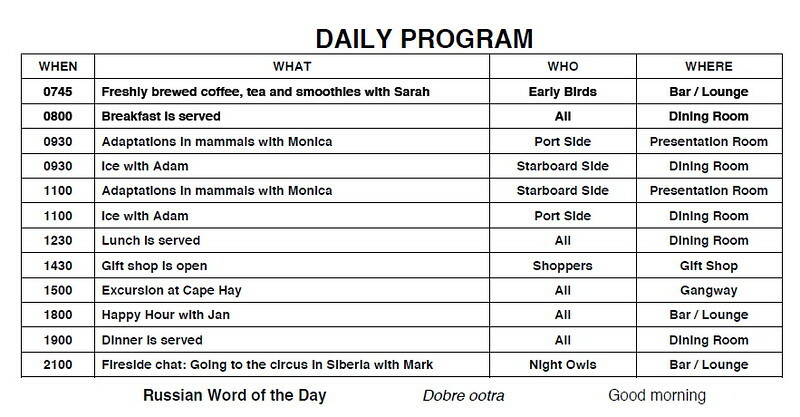 (Shipboard computers allowed passengers to share pictures). Again, not my picture. 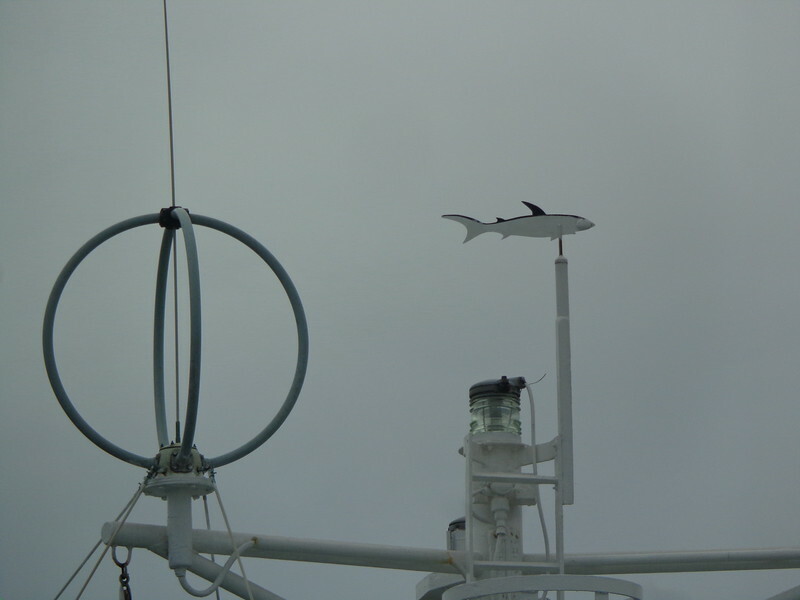 Taken by someone on one of the first boats with an excellent zoom lens. This is my picture. By the time we got there, two bears had jumped into water and they swam away. The third started climbing. He's the white speck at the right, partially up the hill. 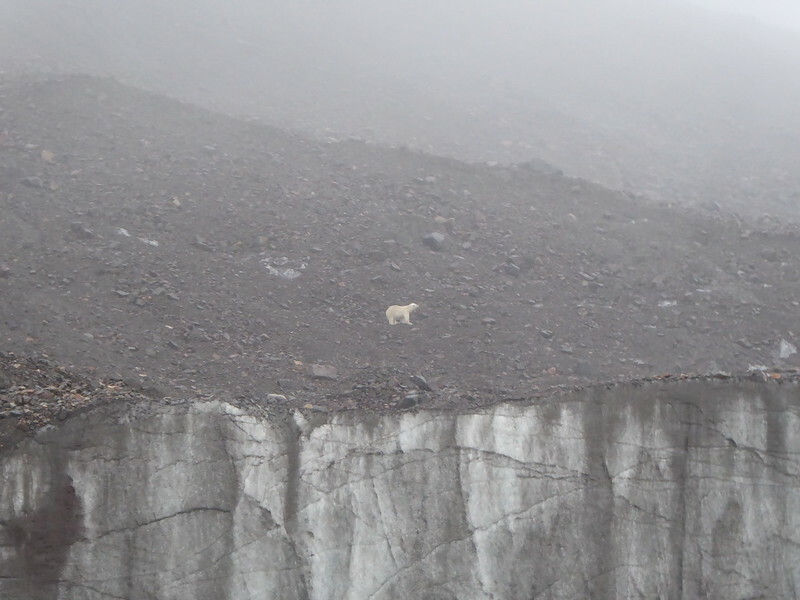 He moved quite quickly up and along the edge and onto the glacier. 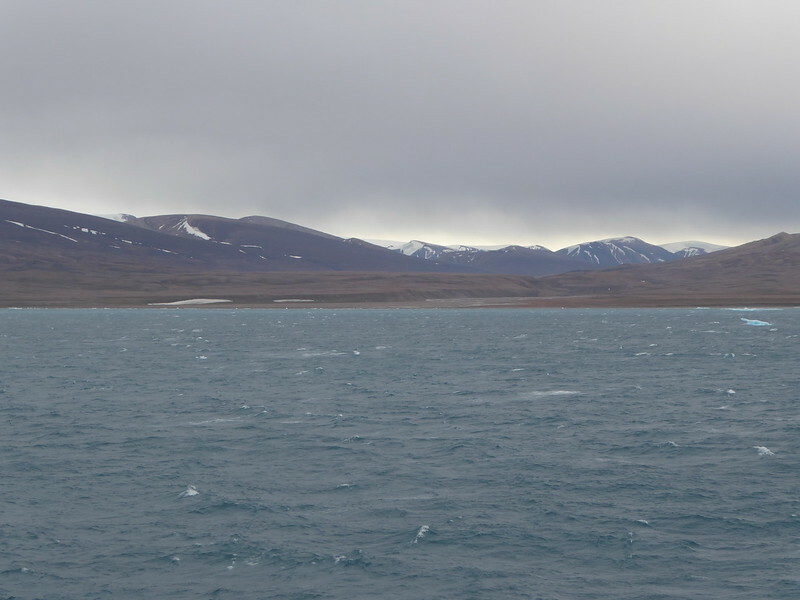 Needless to say, the presence of polar bears nixed any thoughts of kayaking here. 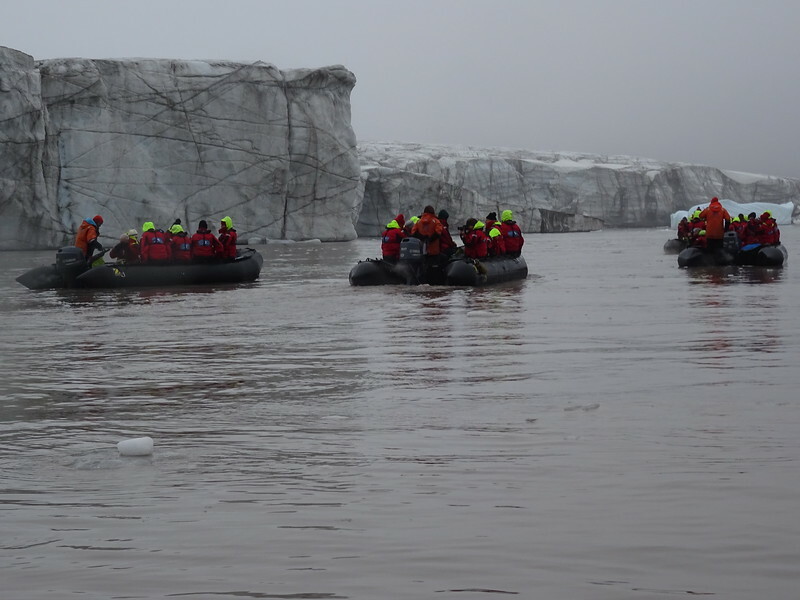 The glacier is quite dirty. 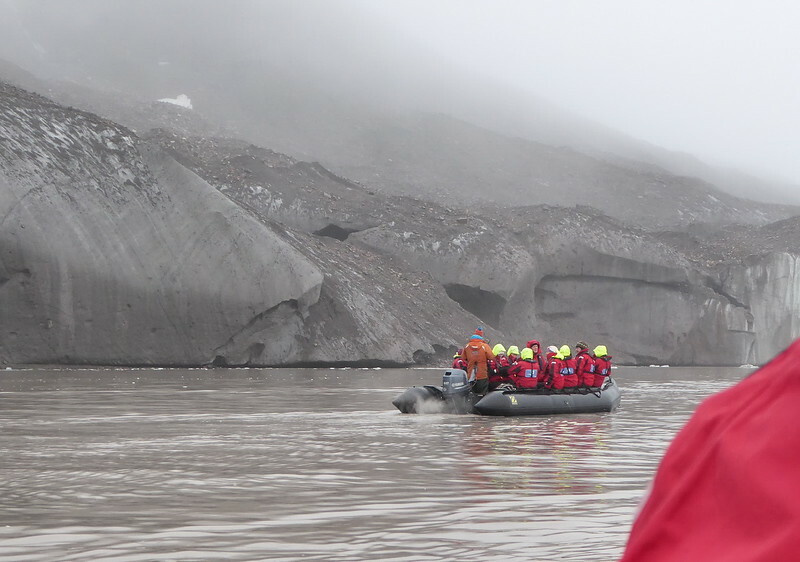 Glacier in the background, looking like a cliff of marble. 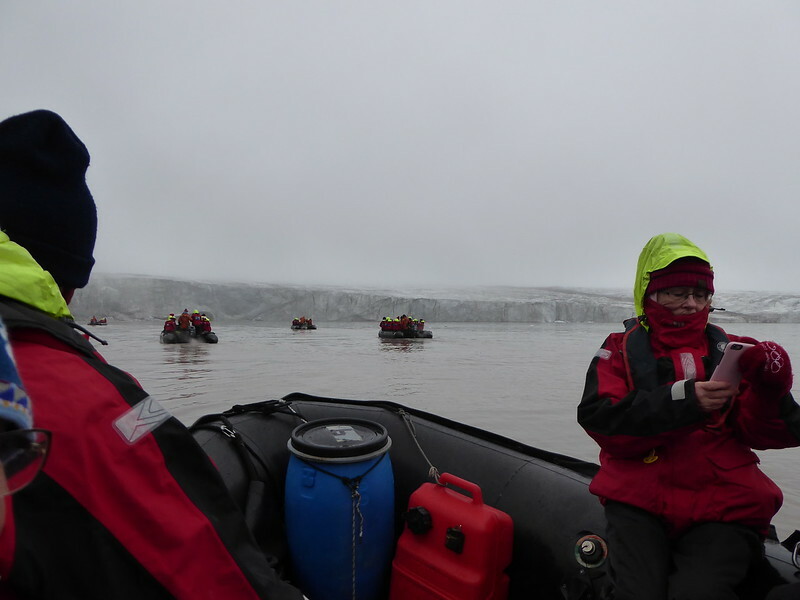 Glacier in the background looks like marble cliffs. Glacier in the background. 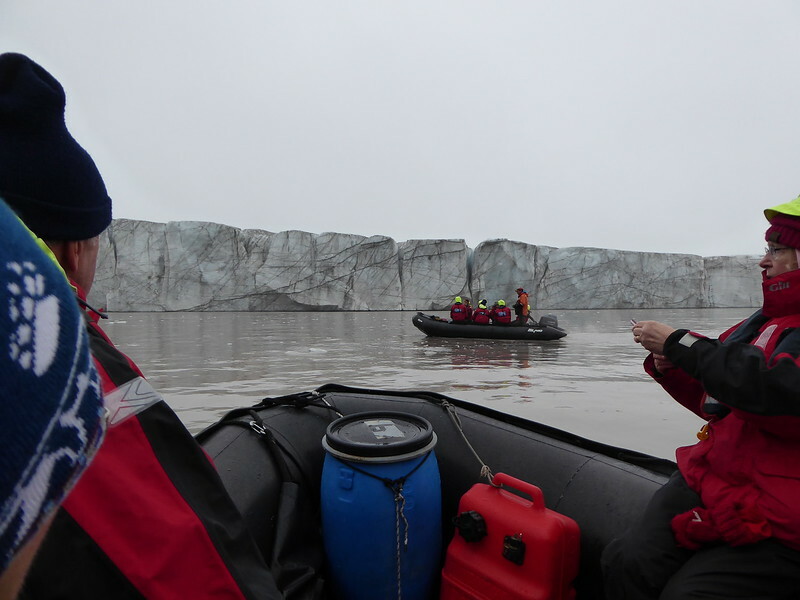 Bob scooped up a small bit of glacier ice from the bay and took it back. The next day he showed Adam how to make a thin section and I had a chunk of it in my evening Scotch. 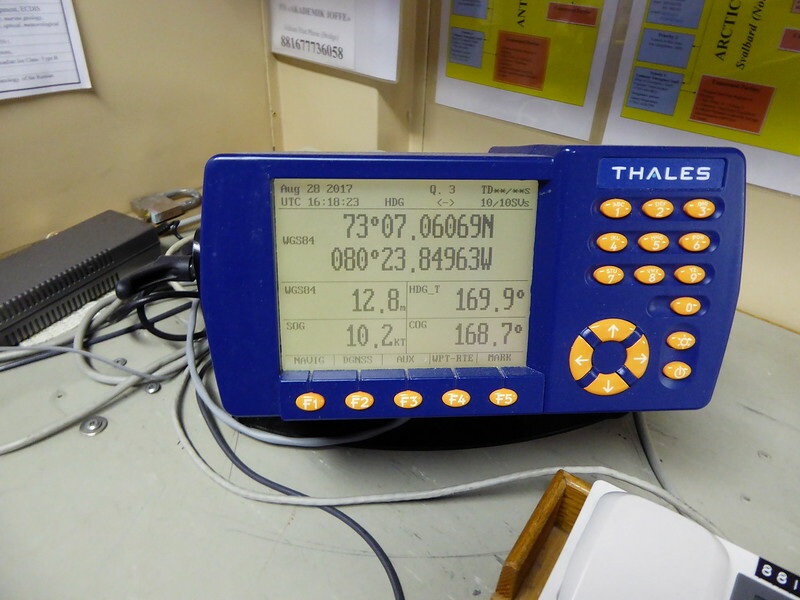 This is a picture borrowed from the ship computer. 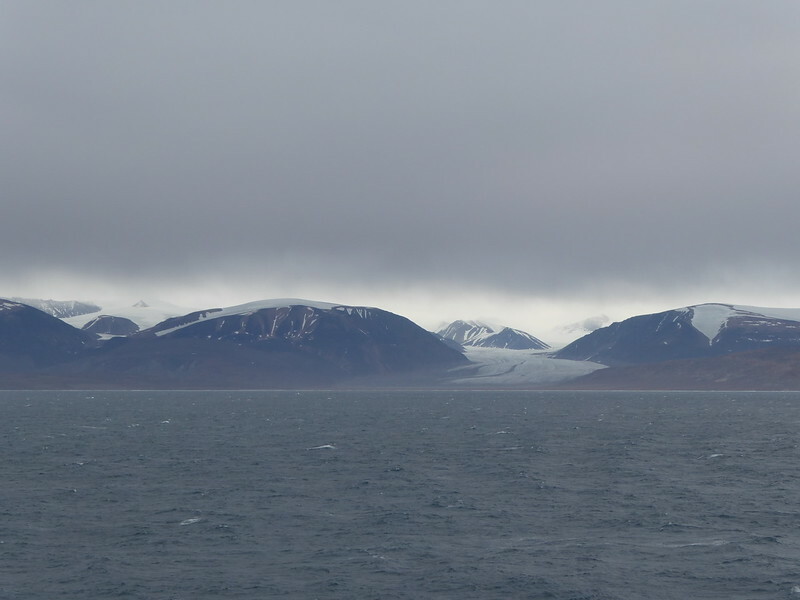 Glacier in the background with some sea ice. 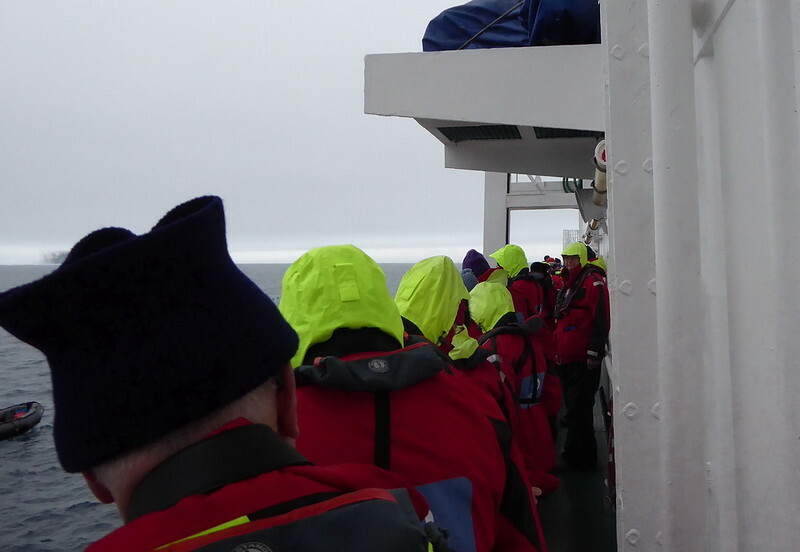 On our way back to the ship. 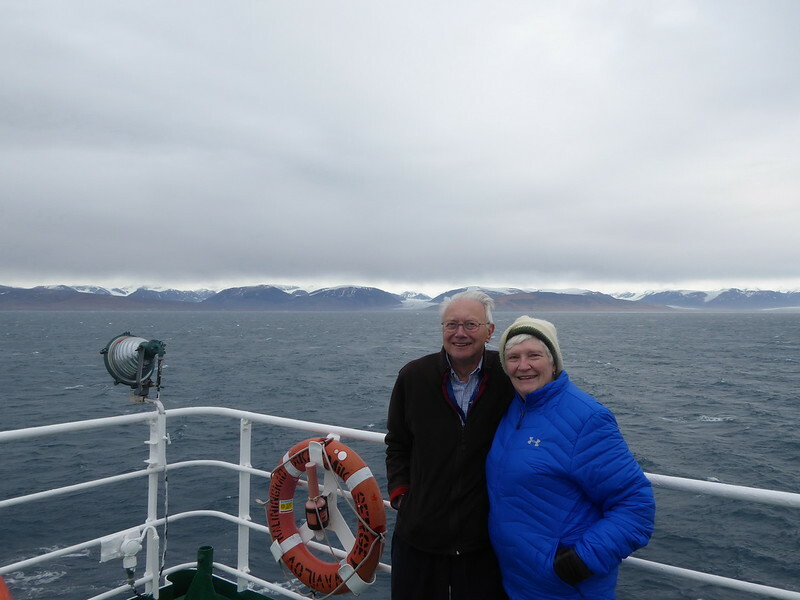 By the time we got near the ship, the winds had shifted and many ice floes had blown in. 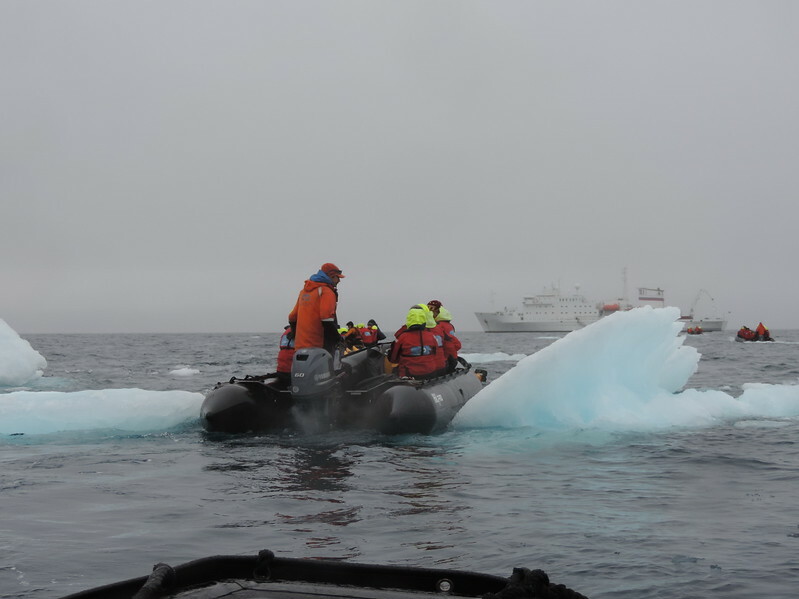 It was a challenge threading our way through the ice in the Zodiacs and in some cases, ice floes were actually moved out of the way. I put my camera away and this is borrowed from the ship computer. 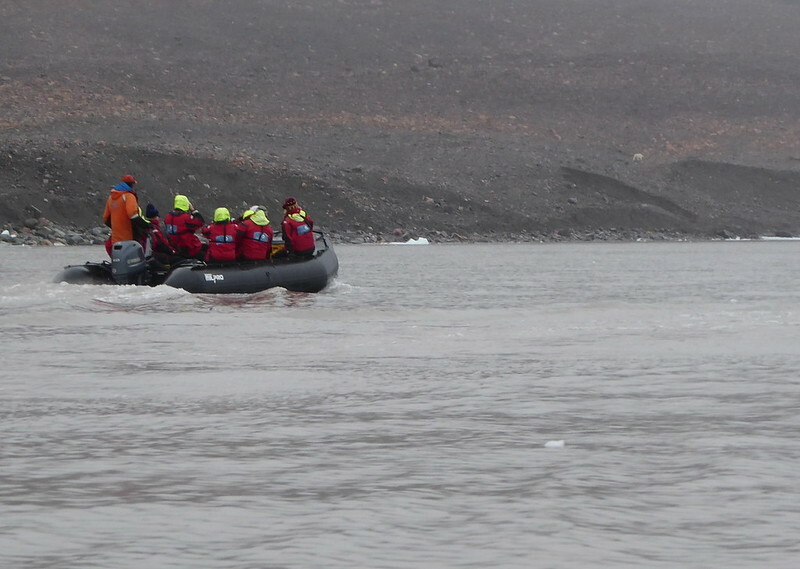 Even more of a challenge getting the kayaks through the ice. 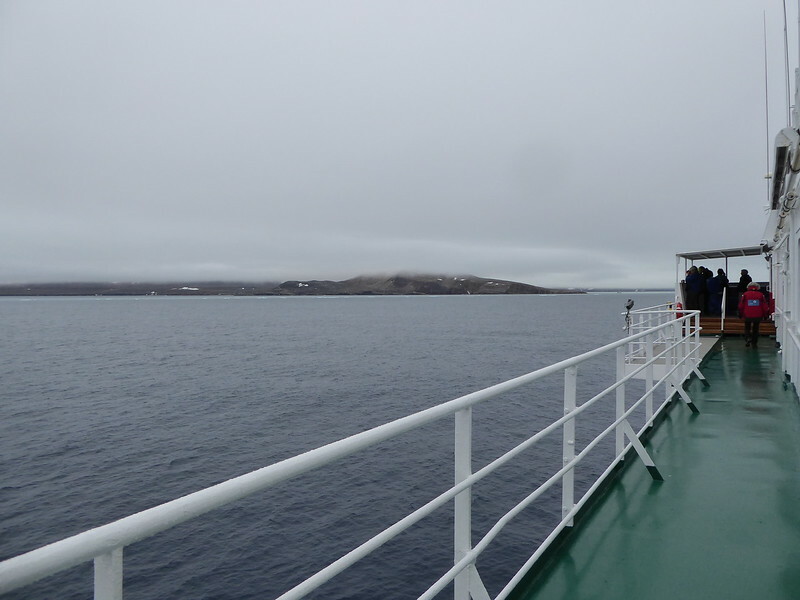 The whole excursion took around 90 minutes. 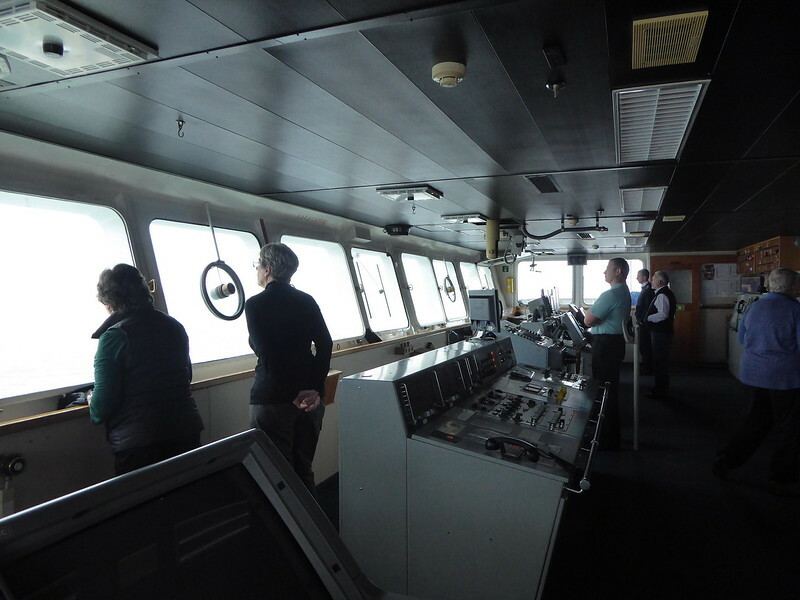 The day opened with great anticipation of getting on land. 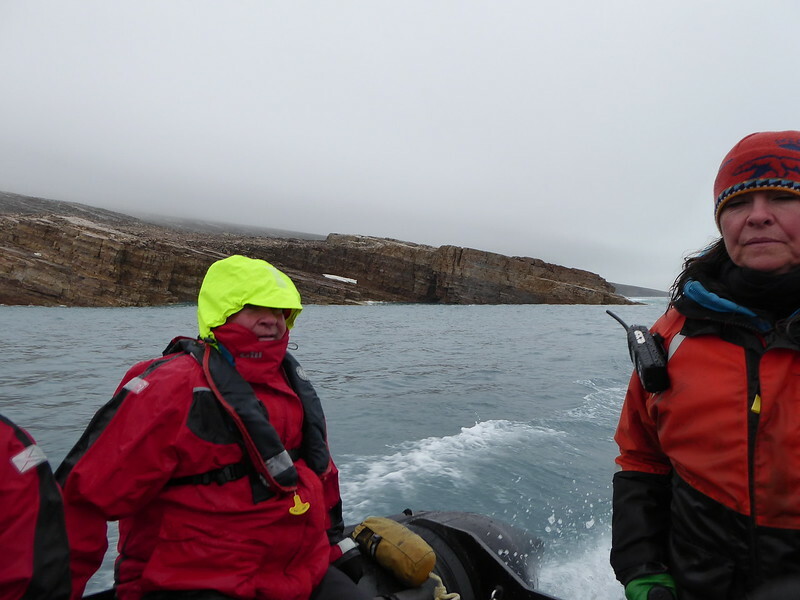 We began the morning making our way through Navy Board Inlet (#8). Bob was hoping to see a camp at which he had done field work, but there was too much fog. 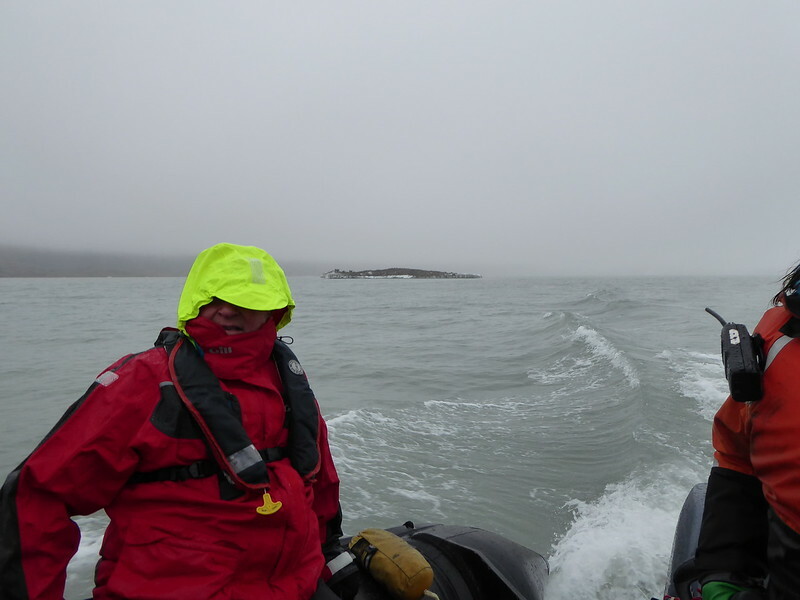 We continued with the intention of making an afternoon outing at Low Point, but when we reached that area, we also had 40 knot winds making it unsafe to launch Zodiacs. No on-shore outing today. 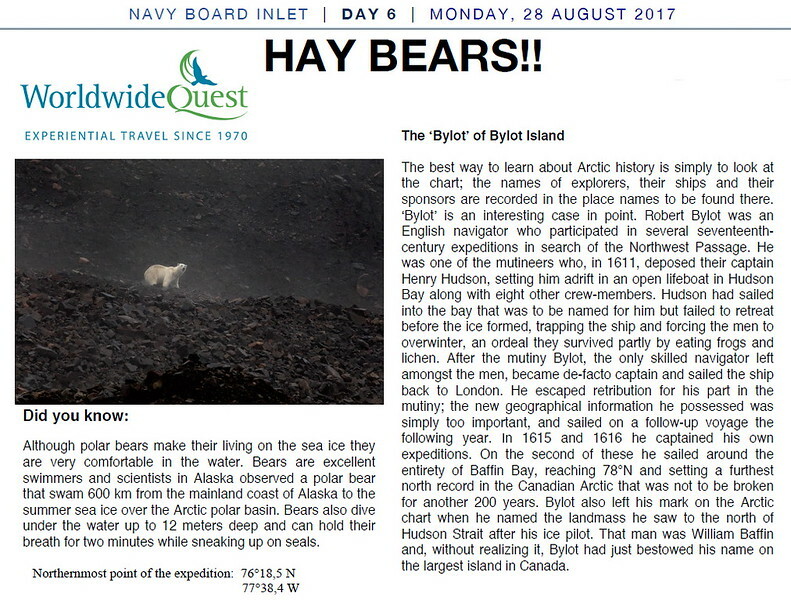 We had already been given presentations on how research is conducted on polar bears and on the effects of climate change in the Arctic. By 2 pm, there was about .3 old-ice coverage close to the west shore. 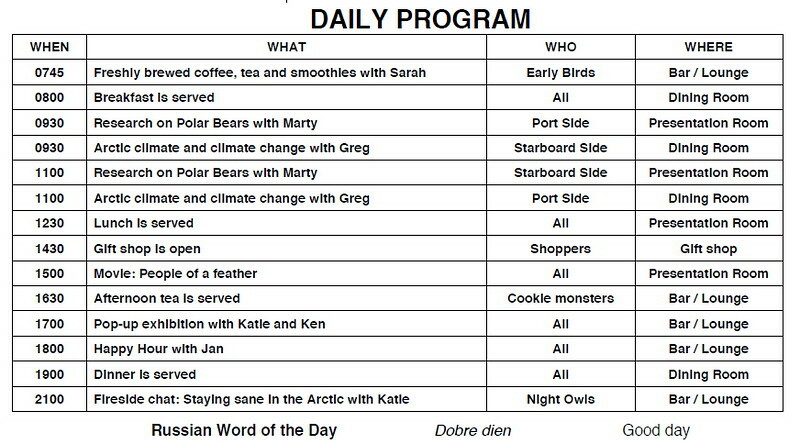 What was added into the program this afternoon was a movie “People of a Feather” which shows how people are dependent on the Eider Duck and how the duck is being negatively affected by hydro-electric projects in the Arctic. 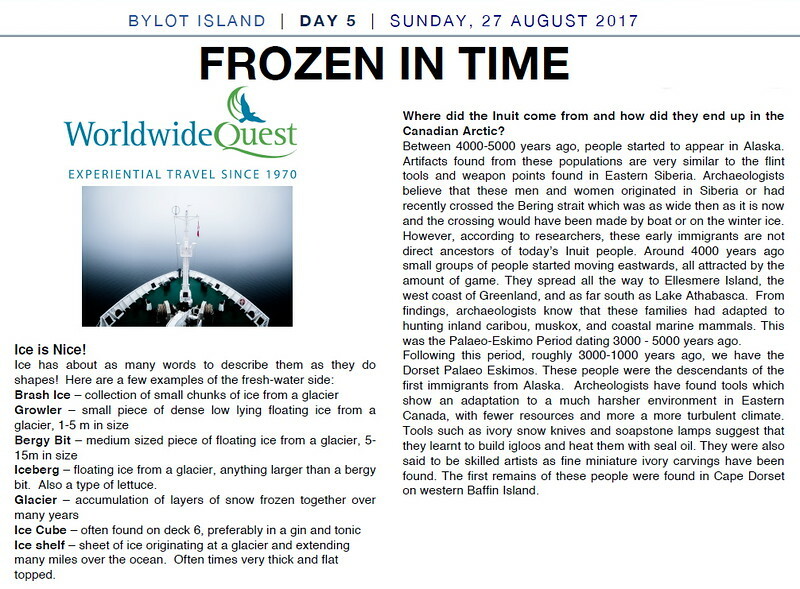 (ArcticEider.com). The film is available by subscription through YouTube - https://www.youtube.com/watch?v=3SMKTzuIbnI and it’s worth the small cost to view it. The film was followed by tea in the lounge and later by complimentary wine and cheese. 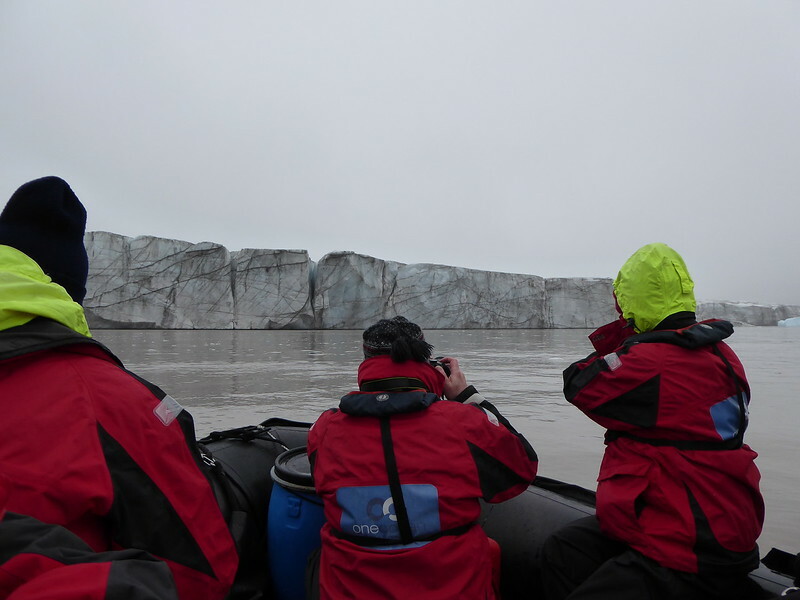 While we didn’t get an outing on land, we did see some lovely mountains, glaciers, ice flows and an iceberg today. 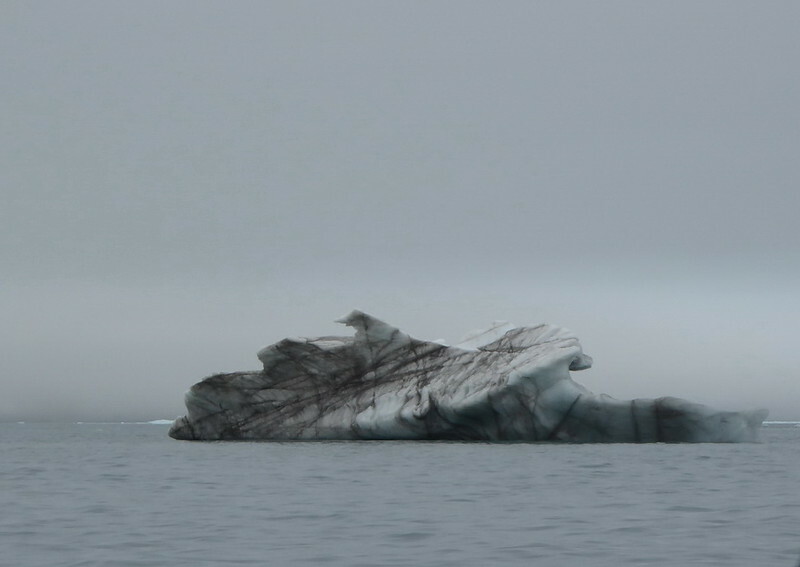 We are finishing the day with a glass of Scotch with glacier ice Bob fished out of Cape Hay yesterday. He showed one of the young researchers how to make a thin section of ice this morning and there is still a more in the kitchen freezer. 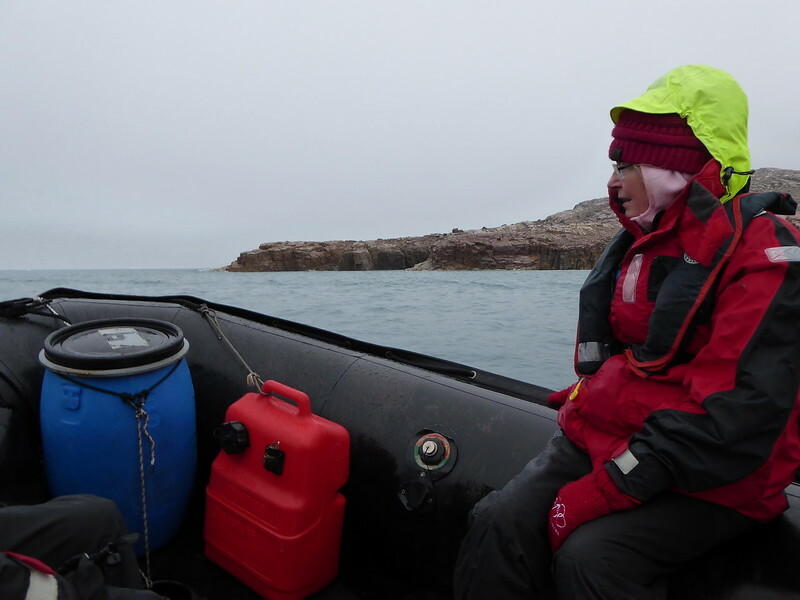 We are now off shore at Pond Inlet and people with cell phones are excited about having connections. Revised schedule for the day after the land outing to Low Point was cancelled because of high winds. 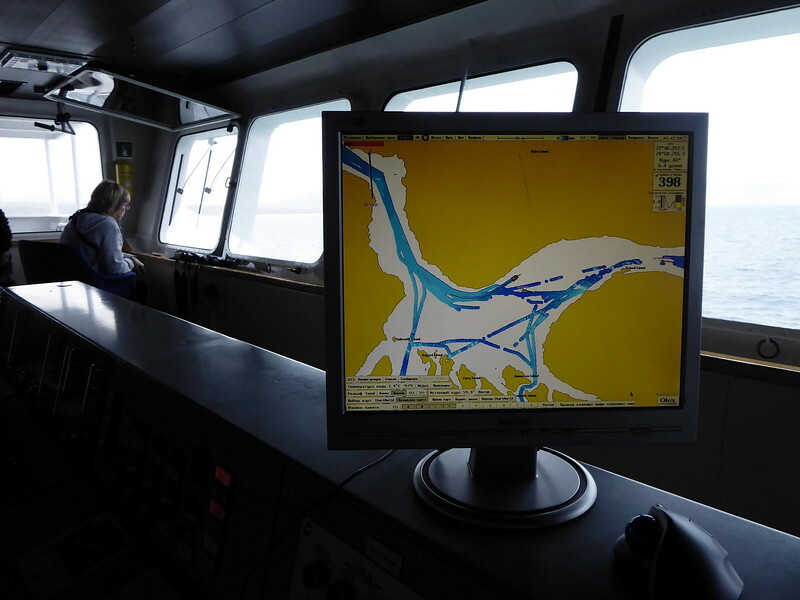 A monitor on the bridge showing route. A borrowed picture because I liked it. Navy Board Inlet - us on deck. Bob rarely remembered his warmer jacket on the deck.